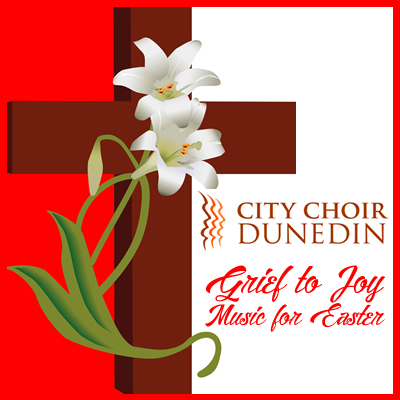 City Choir presented music to celebrate the hope and renewal that is the promise of Easter. We welcomed the Main Street Singers from Los Altos, California, and their director and conductor, Mark Andrew Shaull. The Main Street Singers contributed a selection of choral music to the programme. Currently celebrating the ensemble's Thirty Third Anniversary Season, the Main Street Singers continues to perform a wide variety of works, ranging from Renaissance to Contemporary. The acclaimed group's accomplishments have been earmarked by consistently high caliber of repertoire, performed with expressive skill and musical nuance. Bach's Erfreut euch, ihr Herzen (Rejoice, your hearts) is a cantata composed for the second day of Easter, and first performed in 1724. Bach structured the cantata in six movements, an exuberant choral opening, a set of recitative and aria for bass, another such set for alto and tenor, and a closing chorale taken from the medieval Easter hymn Christ ist erstanden. The music expresses moods of mourning and fear which should be overcome, but especially exhilarating joy. A string ensemble from the DSO will join the organ for this work. Guiseppe Verdi's Stabat Mater (1896) is a 13th-century Catholic hymn to Mary, which portrays her anguish and suffering as Jesus Christ's mother during his crucifixion. Verdi used his operatic skills to set the drama of Christ's crucifixion, mirroring the words with the full chorus thundering anger at the crucifixion. The mood changes at the end where the high voices sing an ascending pattern in the sublime closing Paradisi gloria. Lo, the full, final sacrifice is a festival anthem for choir and organ, composed by Gerald Finzi in 1946. The anthem's text memorializes the celebration of the Eucharist. Regarded as some of Finzi's finest music, the expressive lines, colourful accompaniment and dramatic choral writing make this a great favourite in the choral repertoire. The first chorus entry has been described as 'magical', and the closing eight-part Amen is one of the most remarkable and poignant pieces of choral writing of its period.